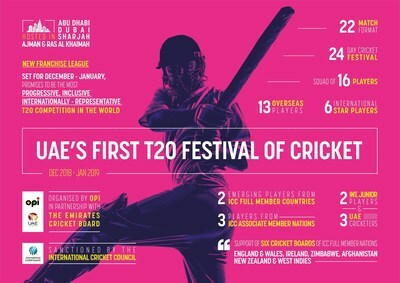 DUBAI, United Arab Emirates, June 13, 2018 /PRNewswire/ — A new elite international T20 cricket league, organised in partnership with the Emirates Cricket Board (ECB) and sanctioned by the International Cricket Council (ICC), is set to take place in the UAE this December 2018 – January 2019. “Our whole focus of what we are trying to do here is to attract talent from all around the world to take part in this competition to help develop young cricketers from Associate Member nations who may have not had the opportunity to play at the highest level in the past ,” said David East, CEO of the ECB. This new festival of cricket will provide opportunities for cricketers from both ICC Full Member and Associate Member countries as well as juniors alike, to play with and develop their skills alongside the very best in the world. The five franchises will comprise a squad of 16 featuring six international star players, two emerging players from ICC Full Member countries, three players from ICC Associate Member nations, two Junior Players and three UAE cricketers. No other T20 competition has been established with these developmental goals at their core, and no other event will showcase such a wide array of international talent. “This competition will introduce the sport to new audiences in the UAE. We want to stage a festival of cricket that is designed to bring the game to all corners of the country and to support grassroots and local cricket,” said Zayed Abbas, ECB Board Member. CaribPR Wire, TORONTO, Canada, Mon. Aug. 25, 2014: Four of the biggest names from the West Indies international cricket team have signed a historical deal that will make them co-owners and stakeholders in the exciting new Canadian Premier League T20. West Indies one-day international (ODI) Captain Dwayne Bravo, Test Captain Denesh Ramdin, opening batsman Kieran Powell and former Captain and veteran Shivnarine Chanderpaul, have signed one of the most lucrative ventures in T20 cricketing history by becoming owner stakeholders of the forthcoming North American League. The deal arrives ahead of the countdown to the inaugural tournament, with officials this week announcing that the tournament will commence on August 1st, 2015. Mr. Roy Singh, CEO and Chairman of the Canadian Premier League T20, is shortly expected to announce details of where the tournament will kick-off its inaugural season. The 10-team League will consist of professional cricketers from around Canada, alongside global cricketing superstars from across the world, League officials confirmed. Like Ramdin, Kieran Powell has also been appointed a co-owner and stakeholder in the League and is looking forward to playing a crucial role in the tournament. The teammates’ sentiments were echoed by West Indies ODI Captain, Dwayne Bravo, undoubtedly one of the most electrifying and in-demand names in global T20 cricket today. Mr. Roy Singh, founder, chairman and CEO of the Canadian Premier League, conceptualized and created the Canadian Premier League in the summer of 2012 after recognizing the opportunity to expand cricket in Canada through the excitement and exhilaration of a glamorous Twenty20 League. The purpose of the Canadian Premier League is to serve as a training ground for developing professional cricket players, coaches and personnel on and off the field and to that aim, emphasis will be placed on fundamental development, career advancement and community involvement. The League will bring about its ‘vision declaration’ by providing cricket enthusiasts with a fast paced, fan-friendly professional sporting event always at affordable prices. To this end, Singh said the League is also looking to build a 35,000 seat state of the art indoor cricket stadium in Canada. The stadium would be the first purpose-built covered cricket facility in the world with a natural grass field and a fixed roof, according to those behind the project. It would be made available for use year-round and host international matches. “CDN$700 million has already been raised for this,” said Singh, while noting that the group is currently in discussion with economic development officials from various municipalities within Greater Toronto who are extremely interested in having the stadium. 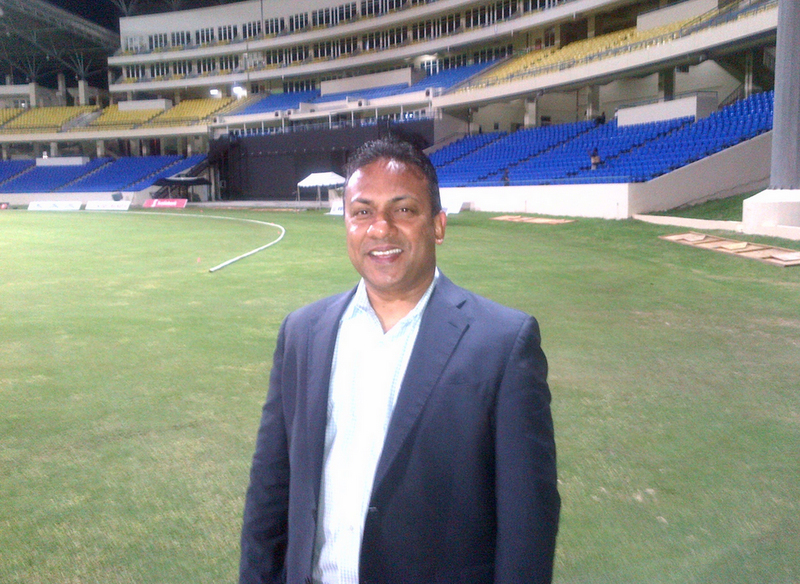 The Canadian Premier League’s management committee includes: Roy Singh, the highly successful Toronto-based entrepreneur who serves as CEO and Chairman; former West Indies Cricket Captain, Shiv Chanderpaul, a director of the company; West Indies cricketing superstars, Dwayne Bravo, Denesh Ramdin and Kieran Powell, who will serve as co-owners; former Toronto Star reporter, Bob Mitchell who has been appointed President; and Emma Everett, Managing Agent to Dwayne Bravo, Denesh Ramdin, Kieran Powell; and Sir Richie Richardson, who will serve as Head of Global Player Operations. CaribPR Wire, LONDON, England, Sun. 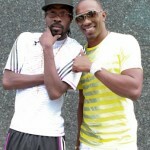 Oct. 6, 2013: West Indies Cricket ODI Captain and one of the biggest sporting stars to emerge from the Caribbean in recent times, Dwayne Bravo, is set to spend his 30th birthday on Monday, October 7th, filming his movie debut in an Indian thriller. Bravo, a flamboyant and renowned entertainer, with two singles already released in collaboration with Grammy-award winning superstar Beenie Man, will feature in a specially created song and dance sequence for the much anticipated Tamil movie, ‘Ula,’ directed by the highly-respected Rajan Madhav and produced by Lv Srikanth Lakshman for Dreambridge Productions. This is Bravo’s first film role and he feels it is fitting that his debut will be in an Indian movie. Although the famed Chennai Superkings team lost in the semi-final round of the Cricket Champions League tournament on Friday, October 4th, Bravo was excited at the prospect of still giving something back to the adoring Chennai public – this time in the form of exhibiting his trademark song and dance moves in the movie ‘Ula,’ which features an impressive Indian cinematic cast including Ajmal, Viddharth, Ashok, Radhika Apte, Gayathrie and several other acclaimed stars. “It was totally unplanned that filming happened to fall on his 30th birthday, but it is a very special way for him to celebrate reaching this milestone and is a testament to all that he has achieved, and continues to achieve” Bravo’s representative, Emma Everett said. Contrary to his image, however, it is not all about glitz and glamour for the gifted all-rounder, who is often referred to as the talisman in the much loved West Indies international cricket team for his incredible energy and confidence. Bravo will, as he does every year, spend his birthday visiting shelters for the homeless and children’s orphanages, to provide to the needy. “It is something I do on my birthday each year. I have been very fortunate in my life, and I try to give back as much as I can to others who are less fortunate. During my birthday this year, I will take a break from filming to go and provide for a homeless shelter in Chennai,” the humble star stated. Whilst Bravo emphasizes an unquestionable priority to his international cricketing career; he does enjoy significant and worthy opportunities outside of cricket, being one of the most in-demand sporting superstars in the world. “On the rare occasions where my tour or training schedule may permit, I do like to challenge myself with opportunities that I feel may have a longer-term impact. There are a number of projects currently in the pipeline which I am very excited about,” Bravo said. CaribPR Wire, Tues. Feb. 1, 2012: As if winning the Caribbean T20 tournament as part of the championship Trinidad and Tobago “Red Force” cricket team and being member of a star-studded Sydney Sixers squad that went onto win this year’s glittering Australian Big Bash title, much to the delight of his millions of fans and followers worldwide wasn’t enough, the energetic, high-profile West Indian international cricketer, Dwayne Bravo, hasn’t simply been sitting back relaxing during a rare few days off in his hectic schedule. Instead, accompanied by his agent and close friend, Grammy-award winning international superstar Beenie Man, the charismatic Bravo has been back in the studio, busy recording a hit new single which was released late Monday evening via Trinidad’s leading stations, Slam 100.5FM and Synergy TV, causing a media and fan frenzy over the catchy new track. But Bravo, nicknamed the “Caribbean Powerhouse,” hasn’t stopped there. The exciting new Dwayne Bravo Surprise-A-Super-Fan initiative is also becoming an enormous hit with his supporters around the world after Bravo and his team decided to show his deep appreciation for his global fan base by surprising unsuspecting “Dwayne Bravo Super Fans,” nominated for a Bravo Surprise Visit by their friends and family. The sporting celebrity stated that he wants to use the “Surprise-A-Super-Fan” initiative to “inspire” people to reach for the same goals he has worked towards all his life, and to give something back to his fans for their years of unwavering support. His management team have also put into place a carefully constructed social media campaign ahead of his much-anticipated official website launch, with the Brand Bravo campaign set to include exciting competition giveaways from sponsors, signed memorabilia from Bravo himself and ongoing updates on the sporting megastar’s cricketing successes and his forthcoming commercial projects, including an exclusive new clothing line set to launch in 2012. Despite a hectic schedule and a multitude of ventures being developed under the shining star of Brand Bravo, the gifted 28 year-old cricketing all-rounder remains humble, down-to-earth and certain about one thing: cricket remains his greatest priority and biggest love; his determination to get back into the West Indies uniform being his most crucial focus.